Announced this morning at Photokina 2018, Nassari360 is a new online software tool that allows you to use your images to create immersive 360-degree experiences. Pitched at content creators and professional photographers looking to give their work an edge, Nassari360 lets the user embed photos, videos and audio into their finished 360-degree packages. Want to show a wedding from the middle of the action, or provide an interactive three-dimensional view of a building’s interior. Nassari360 proposes to give you the means to do exactly that. The software was conceived by wedding photographer John Nassari, who found himself frustrated by the dearth of easy-to-use tools for making 360-degree experiences for his clients. It’s entirely online – no download required – and its images can be made with any camera, including DSLRs and smartphones, though if you already have a 360° camera such as the Ricoh Theta or GoPro Fusion that will certainly make things easier. The software creators have made a few video tutorials on how it all works to get you acclimatised to the process of making your own creations. 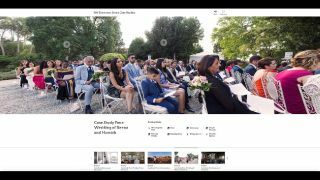 There's a quick intro from John Nassari, a video explainer using a wedding as a case study, a 10-minute start-to-finish 360 project, and more on John Nassari's channel. As 360-degree image files can very quickly balloon in size, the makers recommend using compression software to reduce the size of the images you’re using in your project without compromising their pixel counts. The balance you strike between quality and load time will also depend on what sort of screen you’re planning on displaying the 360° images on. Nassari360 allows you to add your own logos to your finished creations to put your mark on a project, and also has extra features like a curated selection of fonts to ambient soundtracks you can include in your scenes. The Nassari 360 software comes in two flavors: Pro and Pro Plus, which are priced £360 per year and £550 per year respectively. The Pro Plus version allows you to incorporate unlimited scenes into your project (it’s limited to six in the Pro version), and gives you 100GB of free storage as opposed to 25GB in Pro. A 30-day free trial is available for those who would prefer to give the software a whirl before committing – see nassari360.com for full details.